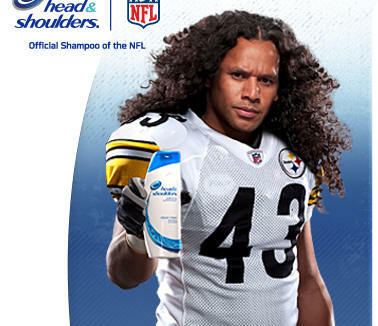 Operation Once in a Lifetime has proudly partnered with Head & Shoulders® and two-time Super Bowl champion, Troy Polamalu, to grant the wishes of seven deserving US soldiers. For the past few weeks, Head & Shoulders, Operation Once in a Lifetime and Troy have been reading through hundreds of entries from soldiers, their families and friends located throughout the US. 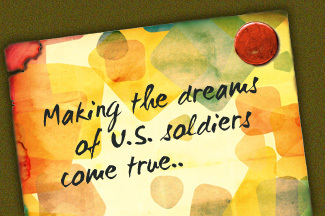 Together, they will grant the wish of one deserving soldier each week for seven weeks. 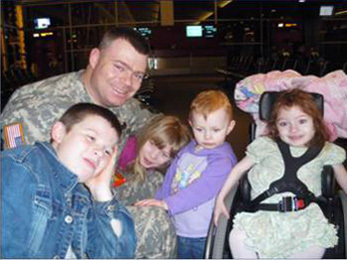 This week we have chosen the Stocksick family from Fort Hood, Texas. Spc. Robert Stocksick is an Army Specialist at Ft. Hood. With his wife Kimberly, the family has three beautiful children: Alex, 6yrs old, and their twin daughters, Samantha and Reagan, 3yrs old. Spc. 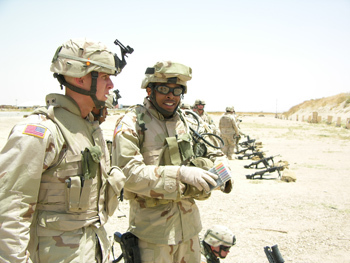 Stocksick returned from his first deployment in May, 2009 to a financially strapped household. They have been trying to save up to drive back home to see their family this December. They cut corners where they can, including using food stamps, looking for extra work and participating in their neighborhood clothing swaps for their children. Unfortunately, one thing kept happening after another, which has prevented them from saving enough. Recently, the family van had a blowout and money set aside went to buying new tires for the van. Before Spc. 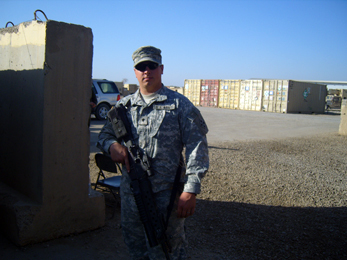 Stocksick's re-deployment in September, 2010, his wife wants him to reunite with his family, especially during this holiday season. In the spirit, they also want to give their children a holiday to remember and have toys and clothes that are truly their own. Head & Shoulders and Operation Once in a Lifetime is proud to grant Spc. 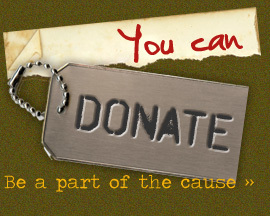 Stocksick's wish by providing the means for his family to come together this holiday season. As well, Head & Shoulders will "stock" the Stocksick household with brand new items for their children for 2010, including books, toys and clothing. 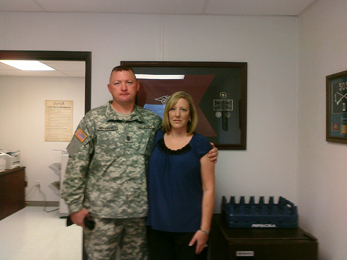 This week we have chosen Mrs. Perri Seamands, Family Readiness Support Assistant at Fort Hood, Texas. Perri Seamands, wife to First Sgt Seamands, is a Family Readiness Support Assistant (FRSA) for the 1st BN Warrior Transition at Fort Hood, Texas. Her battalion consists of wounded soldiers from Iraq and Afghanistan. The soldiers either are medi-vac'ed out of hostile grounds or they have returned to their unit with severe injuries. Mrs. Seamands' role is helping the families of these soldiers because it is vital in their healing process to have their loved ones nearby. Unfortunately most of the time, family members live in other states, which causes tremendous hardships on the families who have to drive back and forth to visit their loved ones. Most families decide to move closer during the healing process and relocate to Fort Hood. This takes a monetary toll on the family: relocating/losing jobs. Injured soldiers are constantly calling to see if there are food, formula, diapers or any resources that soldiers and their families can take advantage of because they cannot make it to the next paycheck. These soldiers, who have been injured in war, now face the added burden of worrying about how to feed their families. Mrs. Seamands wish is to be able to kick off an annual food drive for wounded soldiers so that they can stock the pantries at Fort Hood with items the soldiers and their families can take from year round. Head & Shoulders and Operation Once in a Lifetime is proud to grant Mrs. Seamands' wish by providing funding and guidance for pulling together a food drive so they have the tools to repeat it annually. To kick off the 2009 food drive, Head & Shoulders will also be providing canned goods and non-perishable food items for the pantry. This week we have chosen former Sgt. Margo Simmons from Aliquippa, Pennsylvania. Sgt. 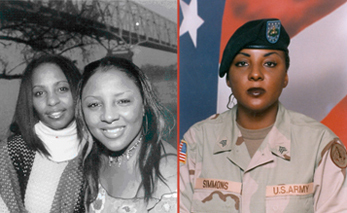 Simmons recalls her most profound experience when she was deployed to Iraq on active-duty in 2002. The Iraq she knew back then had no running water, hot meals, or electricity. When she actually had some time to sleep it was on the ground, and then eventually in abandoned buildings. But the most heart-wrenching pain she experienced was when she returned from Iraq and the harsh reality of the real world kicked in. Upon her return, Margo was out of the military and out of a job. Within six months her unemployment ran out and then her savings, which led to the repossession of her home and eventually homelessness. She moved in with her parents and made do with minimum wage jobs. Having graduated with a Bachelors of Arts from the University of Pittsburgh and a decorated veteran, she couldn't fathom how quickly her life had changed. Despite all these setbacks, Margo still strived to pursue her dream career as a professional singer. As a former VH1 Save The Music 2005 Honorable Mention Songwriter, Margo would like the opportunity to make a demo tape. Head & Shoulders and Operation Once in a Lifetime is proud to grant Sgt. Simmons' wish by providing her with the opportunity to record her demo tape as well as set up a meeting between Margo and a music industry insider to help her get her foot in the door. This week we have chosen Sergeant Casey Nelson from Fort Hood, Texas. Sgt. Casey Nelson has been in the Army for nearly five years. 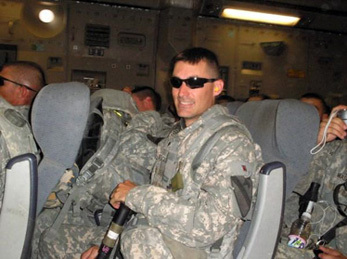 After the death of his first son from Pyloric Stenosis, a severe gastric condition, he decided to join the United States Army in order to provide for his family, and give back to America. Sgt. Casey suffers from Post-Traumatic Stress Disorder since returning from his second deployment in February, 2009. While he has been struggling to adjust back to "normal" life, the bright light in his future is that him and his wife are expecting a baby boy soon. It has been a very difficult pregnancy, and doctors have told them that their son will need surgery for the same condition from which their first son passed away. The Nelson's are elated to welcome this child to their family, but are concerned about the ever increasing costs of raising and caring for their new son. The Nelson's have stripped their lives down to the basics, in preparation for the birth of their son. In fact, Sgt. Nelson even sold his prized motorcycle to help make ends meet. Sgt. Nelson and his wife's greatest wish is to provide comfort for their newest addition. They say, "I know that might not seem like a dream but when you have a family and have already lost a son, providing comfort is everything to you." To celebrate the arrival of their son, the Nelson family wishes to have the necessities that a family needs to properly welcome home a baby boy. Head & Shoulders and Operation Once in a Lifetime is honored to help the Nelsons in this time of need by providing them with the essentials to take care of a newborn in addition to covering their home expenses for three months as they settle in and bond with their new family member. 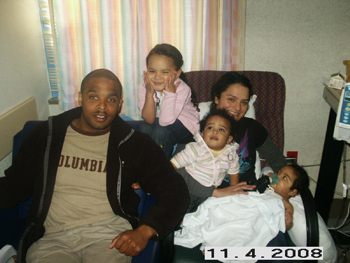 This week we have chosen the McPherson Family from Fort Lewis, Washington. Sgt. 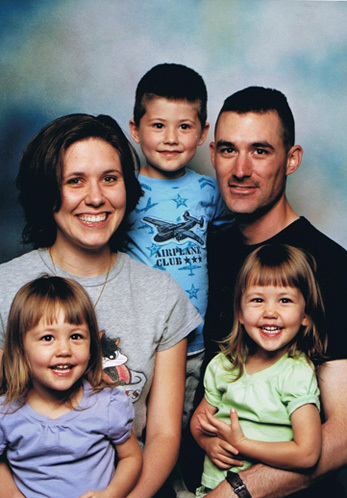 McPherson's family includes four young children ages three, five, seven and 10 that live at home with their mother while he is overseas fighting for our country. Taking care of four children without her husband home to help often leaves Mrs. McPherson overwhelmed, especially with their five-year-old daughter Tiffany being paralyzed. Tiffany was born with Spina Bifida which is a birth defect that left her with a spinal cord that is not completely developed. The paralysis and additional complex medical problems affecting Tiffany are a result of this condition. At such a young age, Tiffany has already undergone numerous medical treatments that many people do not experience in a lifetime. Tiffany recently had her tenth surgery as part of her treatment- six of these 10 surgeries being brain operations, and more surgeries are scheduled over the next few years. Because of her health, Tiffany must attend physical therapy three times a week in addition to her doctors appointments. For her to receive the proper care that she needs, the McPherson's frequently travel to the Children's Hospital which is nearly 60 miles away. The sole source of transportation for the McPherson family is their rundown minivan. With Tiffany's wheelchair, the minivan does not accommodate the McPherson's or their needs. Each time the family travels together, Tiffany's wheelchair must be disassembled, leaving little space in the minivan for the other three children, much less groceries. It is easy to see how difficult it is for the McPherson's to properly care for Tiffany and to carry out simple daily tasks with their current mode of transportation. The McPherson's wished for adequate means of transportation that will help alleviate some of the stress of their everyday lives. Through the Heroic Seven wishes program, Head & Shoulders and Operation Once in a Lifetime is proud to grant the McPherson's wish by providing them with a new handicapped accessible van. 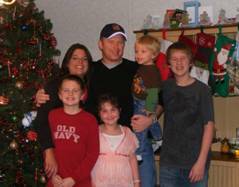 This week we have chosen the Buglehall family from Greenville, Texas. Two years ago, as Sgt. 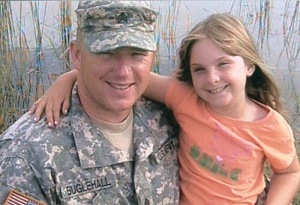 Matt Buglehall Infantry Team Leader, was training for his deployment to Iraq, his 9-year-old daughter McKayla was diagnosed with Fanconi Anemia, a rare blood disorder. One of the biggest challenges facing Fanconi patients is a malfunction of the bone marrow, which reduces healthy blood cell production and, in turn, significantly impacts all systems of the body. Eight months after her diagnosis, McKayla had to have an emergency bone marrow transplant in Minneapolis, Minnesota. Fanconi Anemia is an unpredictable disease and often leads to shorter life spans. Although there are options for treating Fanconi Anemia, they are expensive and specialized. Due to Sgt. Buglehall's second deployment to Iraq, McKayla and his wife have had to make additional trips to Minneapolis on their own as McKayla receives treatment. Sgt. Buglehall and his wife, as any parents, would like to provide McKayla, now 11-year-old, with the best possible care, which will require traveling back and forth to her specialists. The Buglehall family's wish was for assistance in getting McKayla to Minnesota regularly for her continued care. Through the Heroic Seven wishes program, Head and Shoulders and Operation Once in a Lifetime is proud to grant the Buglehall's wish by proving the means for McKayla and Mrs. Buglehall to fly between Texas and Minnesota as well as providing accomodations during their travels for an entire year. 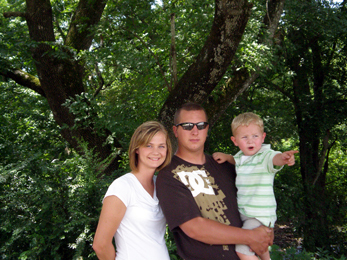 This week we have chosen the Logan Family from Fort Leonard, Missouri. Over the last year, the Logan family has experienced both emotional and financial hardships due to their daughter Leila's severe health complications. When Leila was six-months-old, she fell into a coma. The diagnosis from this traumatizing experience was that she had to have 90% of her small intestines removed. In the months that followed, Leila's health continued to fluctuate and sadly the Logan's almost lost her several times. The Logans have so much to handle. Figuring out how to simultaneously pay for the mortgage on their home in Missouri and having furnished accommodations close to the hospital in Nebraska has been w eighing heavily on their minds. In an attempt to earn extra income, Sgt. Logan has volunteered to return to Iraq for a third time, but even with this heroic gesture, it will unfortunately not be enough to make ends meet. We all know that asking for help is difficult. They wished for help to alleviate some of the financial stress they will face when Leila is the lucky recipient of an organ transplant in Nebraska. Through the Heroic Seven wishes program, Head & Shoulders and Operation Once in a Lifetime is proud to grant the Logan's wish by paying their rent for the six-month stay in Nebraska during Leila's transplant operation and recovery. Continue to check in each week through November 2nd as we grant the wish of another deserving soldier. To find out all the exciting things Troy is doing with Operation Once in a Lifetime and Head & Shoulders, please visit www.TroyTacklesMore.com.